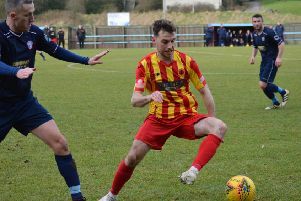 Stewart Maxwell’s side came from two down to KO last year’s winners in a penalty shootout and take their place in the quarter-final draw - which then gave them a home tie with League One side East Kilbride Thistle. Hurlford had early chances. Calum Watt’s curling cross was headed on by Paul McKenzie before being scrambled clear and a Michael Reilly ball into the box found no takers. Rabs claimed handball when Scott Walker’s shot was blocked in the box. But it was Hurlford who made the breakthrough on the half hour mark when keeper John Hutchison miskicked in his box and then brought down Reilly with a late challenge. Referee Graham had an easy decision in awarding a spot kick and showing Hutchison a yellow card before Liam Caddis stroked the award into the net. Ryan Caddis had a chance to increase the ‘Ford’s lead but was foiled by a timely Scott Forrester tackle. Nevertheless Hurlford did go two up in the 38th minute when from a Reilly corner kick, McKenzie fired home from the edge of the penalty box. The Ayrshire side were well on top Liam Caddis fired an effort from distance over the bar. However the game changed dramatically a minute before the break when Forrester was elbowed in the box by Adam Hodge and referee Graham showed the defender his second yellow card whilst awarding the game’s second penalty kick. Gary Carroll stepped up and gave keeper Alistair Brown no chance from the spot. Hurlford began the second half on the attack with McKenzie flashing a shot past the goal, and then Sam Lidington sent a snap shot wide. With the wind behind them Rabs eventually started to take advantage of the extra man and equalised in the 52nd minute when Carroll ran through the visitor’s defence before hammering a 10-yard shot beyond keeper Brown. The Roy then looked the more likely to progress with Michael Daly’s saved under the cross bar by Brown then substitute Willie Sawyers headed a Gavin Mackie cross wide. 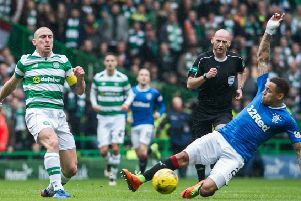 Rabs should have had the tie done and dusted with three minutes remaining when from substitute Lee Gallacher’s cross Carroll knocked the ball wide of the post from a few yards out. There was a stoppage time scare for Rob Roy when Ryan Caddis was fouled on the edge of the box and Lidlington’s free kick was brilliantly pushed aside by Hutchison to take the tie in to a penalty shoot-out. After Gallacher netted the first spot kick, Hutchison saved Ross Robertson’s effort before Carroll failed to take advantage and sent his effort wide of the post. Cameron Clark, Gavin Mackie and Martin McBride scored the rest of the regulated penalties with Lidlington, David Barron, Lewis Morrison and Liam Caddis replying for the visitors. As the shoot out went to sudden death, Daly converted before Richard McKillen’s effort was well saved by Hutchison to win the tie for the Rabs.